A brilliant-minded and a highly educated doctor of philosophy might ask today: "How much education did Jesus Christ have?" After all, there's no record of His having gone to any university — if they had such universities in that day, as we have today. Today one goes to school, and finally to the university to get an education. It's like going into a grocery store to buy a loaf of bread, you go into the store, you ask for the loaf of bread, the clerk gives you the loaf, you pay your money, you pick up the loaf, you walk out with it. So, you go to college, you go to the university, you pay your tuition, they funnel into your mind, inject into your mind, an education, and you go out with it. Already made, whatever they put into your mind. That is modern education. Now, in Jesus' day evolution had not yet been evolved. And in the last hundred years evolution has been the basic concept, and the basic premise on which all of the present-day knowledge explosion has been based. It's been built on the premise of evolution. Of course, if the premise is false the knowledge based on it is false likewise. A lot of people don't realize that. Now in the decade of the sixties we were having a knowledge explosion, indeed we've had one this whole century, in the twentieth century. And Doctor Clark Kerr, President of the University of California at Berkeley, said that; "The university of today is a factory." Its business is manufacturing knowledge, knowledge production. Educators have said, along with scientists, for the last two or three hundred years as a matter of fact, "Give us sufficient knowledge and we will solve all of our problems, and we will rid the world of all of its evils." Well, we've had a knowledge explosion, we've had much knowledge production. 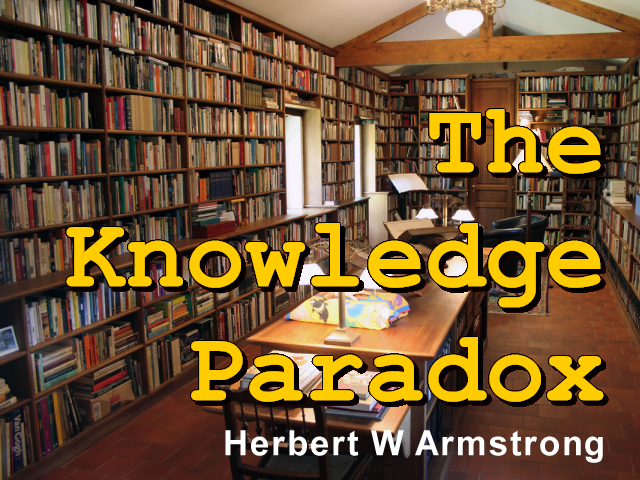 As a matter of fact, in the decade of the 1960's the production of knowledge doubled the total fund of knowledge in existence. Now of course, that was mostly in the area, in the fields of medicine, technology, and science, and things of that sort; it didn't filter down to the average individual. But the knowledge didn't cure the problem, didn't solve our problems, or cure the evils. Evils doubled also in that decade. And today, we have the paradox of such marvelous accomplishment by modern science, technology, industry, government, sending men to the moon and back. I've mentioned time and again, the marvels of television, pictures, voices just going through the air, your antenna picks it up right out of the air, what a marvel that is. The modern airplane, the modern automobile, sending unmanned spacecraft to land on the surface on Mars, and send back close-up photographs on the very surface of Mars. Close-ups of Saturn, and Jupiter, and all planets in outer space. The marvels of science are just beyond words, and yet the world has never been in so much trouble. What a paradox! Troubles at the same time, that we have such great and marvelous accomplishment. But, do you know how it all began? This paradox all began with the incident of the forbidden fruit, and we need to go back to the beginning to see how it started, how it developed, what are the causes, what has produced our troubles today. What has produced our knowledge, what has produced our accomplishments and what are they? Today humanity is discontented, today there is no peace, today people are unhappy, today half of the world is living in abject poverty. Many are starving, they're living in filth and squalor, today half of the world is in utter ignorance, no education. What a world we live in. In spite of all of the modern progress there has been such retrogression What a paradox! Not an immortal soul, but what was made from the dust of the ground became a soul. In other words, the soul then is composed of matter. Now the point I want to bring out right here is that; you have a temporary, physio-chemical existence. You do not have real life. In God is life, life can only come from life, that's the first law of bio-genesis. That is a scientific law, that life can come only from life, not from the not-living. God is the source of all life; and He gave a temporary life to the first man, Adam, in the Garden of Eden. Now, Adam was not made quite complete, he needed a woman, a wife to be with him. God wanted him to reproduce and to multiply and replenish the earth. He couldn't do that without a wife, and so God supplied him with a wife. He was only half complete, and God gave him the wife. But there was something in the man's mind different from animals. Man had a mind. There was a spirit in man that imparted the power of intellect to the physical brain. Now animals had physical brains precisely like the human brain. But animals can't think, animals can't have the knowledge that a human can have, and the spirit in man makes all the difference. But man was still incomplete — he needed another Spirit. He needed the Spirit of God to be finally born of God, because he was made from the dust of the ground, from the earth. Now, there are two kinds of knowledge that the man needed. One was physical knowledge, materialistic knowledge; he was made with the ability to acquire that kind of knowledge. But he needed spiritual knowledge in order to have a relationship with his God, and in order to have a relationship with his neighbor; because man was to reproduce until there would be actually ultimately millions and billions of him. And man needed to get along with his neighbor and he needed another Spirit with the spirit that was born in him; that is, created in Adam, and born in all of us since Adam. So, in the Garden of Eden, in the midst of that garden were two very special trees. They were symbolic trees, they were probably very literal trees. The one was not an apple, Adam did not eat an apple, that much I can tell you. But, one tree was called the Tree of Life, the other was the Tree of Knowledge of Good and Evil. And actually they represented two different kinds of knowledge. The one tree of the Knowledge of Good and Evil represented knowledge that man could produce himself, physical materialistic knowledge only. But the Tree of Life would have given him the Spirit of God, which would have given him spiritual knowledge; knowledge to deal with God, to have a relationship with God, and knowledge to deal with his fellow man, and to deal with people. But Adam made the wrong choice, Adam chose to go it alone. Adam followed his wife Eve, she started the ERA movement. A woman began taking the lead right off the bat, and is still trying it today. And so, Adam said he didn't need knowledge from God. In other words, to shut up the Tree of Life. And the Tree of Life was shut up from mankind until Jesus Christ the second Adam came and was born. Now Jesus Christ was born a little differently than any other human has ever been born. Jesus Christ was the Son of God as well as the Son of man. Jesus' Father was not a human man, His Father was God. He was born of a human woman however, so He was human. But He was born of the Divine Father so He was Divine. He had immortal life, He had life inherent at the very beginning. That is, He had had life, but now He did not have inherent life, He was human, so He could die. And He did ultimately die, but God raised Him from the dead and through a resurrection He became the Son of God as you read in the first verse or two or three of the first chapter of the book of Romans in your Bible. The Tree of Life was closed from man, which simply means spiritual knowledge, the kind of knowledge to really understand spiritual things, to have a relationship with God, to get along with man. But God did not give man life immediately. Now we read in Acts 2:38, on the day the Church was founded, Jesus had come, the Second Adam. He was going to open the Tree of Life, He said; "...I will build my church..." (Matthew 16:18). He trained His disciples for three and a half years, He was crucified, He died. He paid the penalty of man's sins in the place of man by His shed blood. He reconciled mankind to God by His death. He didn't save us by His death, He reconciled us to God, and God has eternal life to give, but we are saved by His resurrection. The Spirit of God impregnates us, begets us with immortal God life, Spirit life. Unless the Spirit of God dwells in you, you are not a Christian. I don't care how many churches your name is written on, how many church books, how many you think you belong to. It's just like belonging to a lodge or a club; unless the Spirit of God dwells in you, you are none of His, you are not Christ's, you do not belong to Him. In other words; spiritual knowledge. How does knowledge enter your mind? The only way knowledge can enter your mind normally and naturally is through what you see in the eye, what you hear through the ear, what you can taste in the mouth, smell through the nose or through the sense of feel and touch. There's no other way that knowledge enters your mind naturally and normally. So, you can't have spiritual knowledge, you can't know the things of God. When you receive the Spirit of God it will open your mind, and reveal your mind to spiritual knowledge. Until that time, you're only half there mentally. The most highly educated people in this world are only half there mentally. That's why knowledge in this world is materialistic, it is limited to what can be seen through the eye, heard through the ear, or smelled through the nose, tasted through the mouth, or felt by the feel of touch, and feel, through the sense of feel. That's the only way that man can come into knowledge. Now, that begins to explain this great paradox. Man has been limited, he's only been half there mentally, and he's developed a great education all confined to the materialistic in the physical realm. But our problems and our troubles are spiritual in nature! The Law of God defines a way of life and that way is love, and it's love out flowing from self. I call it the way of GIVE, to simplify it. And the opposite way that man is living is GET. Incoming lust, and greed, and coveting, and envy, and jealousy toward others, and all that sort of thing. And that's the way people have been living. That's why the world is in trouble. We're accomplishing great things physically and materially; we've developed physical and material knowledge, we have been born with the capacity to do that. But, we have not, without the Spirit of God, had the knowledge to get along with our fellows; or to have a relationship with our God, and our Maker, and to receive immortal life, God life. The kind of life that God Himself has and that man does not have. Adam's mind, in other words, was only one half complete. Now, we were born with, you might say, a mind only half complete. Jesus was born, however, with a complete mind. Jesus was impregnated by the Holy Spirit of God. Jesus was born with the Spirit of God. Jesus had the Spirit of God from birth, and they wonder what kind of knowledge He had. His mind was full and complete. The minds of the great professors and of the doctors of philosophy today, have what has been funneled into them in a college or university by other people. But their minds are only half there. Jesus' mind was complete; Jesus was born complete, begotten by the Holy Spirit, and as such He was the only begotten Son of God. The only one ever born human who'd been begotten of God, He was the only One. Now, we are born, as you read in Romans 8:7, with a natural carnal mind that is enmity, or that is hostile against God, and is not subject to the Law of God; which is the law of love, and the way toward peace, and the way toward happiness, toward joy, toward contentment, and the things that we seem to lack, and that we don't have. We want to get, and what do we want to get? Physical material things, money, and the things that money can buy. But they don't make us happy, and the world is not happy, and the world cannot be happy unless, or until, it receives the Spirit of God. Just saying; "I receive Christ is not enough". You have to "...Repent, and be baptized..." (Acts 2:38) as Peter said on the day of Pentecost, and then, maybe you'll receive the Spirit of God, the Holy Spirit of God. But that by a resurrection. This life is not the end; there is an after life by a resurrection. Now, I would like to have you come to understand some of this and I have written a very special booklet, it's just off the press. It's called: 'Never Before Understood - Why Humanity Cannot Solve Its Evils. ', its troubles. It's never been understood before. That goes into what I have just skimmed though and given you a little of in this program. But this book will give it to you much more complete. It is knowledge never before understood, it is knowledge that you won't get in any Church; you won't get it from any preacher. It's knowledge you won't get from modern science, you won't get it in any college or university. It's knowledge that society does not have, that this world does not have. It's knowledge that comes from the very Word of God that gives you understanding. 'Never Before Understood - Why Humanity Cannot Solve Its Evils.' That is a remarkable booklet, one of the most important booklets I have ever written. I would like to have you receive it and there's no charge, no follow-up requesting money; we just don't do that, we believe in giving. God's way is give not get. We're not out to get. And so, until next time this is Herbert W Armstrong — goodbye friends.